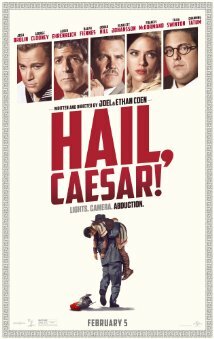 Hail, Caesar was a flick I did not expect to go see but with much persuasion from a friend I took that leap and gave it a shot. I will be honest and say I am not really knowledgeable about Coen Brothers movies except a select few. I went in not expecting a lot and came out with the same opinon. I got a few laughs but maybe I'm used to other types of humor or maybe Hail, Caesar simply did not just fully catch my attention. An all-star cast made this movie possible, including: George Clooney, Scarlett Johansson, Josh Brolin, Channing Tatum, Jonah Hill, Alden Ehrenreich, Ralph Fiennes, and many, many more. They are all actors in the 1950's and the movie portrays how the business was back in the day. Josh Brolin's character Eddie Mannix is the main guy in charge of the film company he works and has the job to keep everyone in line (his title is a "Fixer"), including the actors, directors, editors and even those who clean toilets around the studio. A lead Baird Whitlock (George Clooney) goes missing and later Mannix finds out he is kidnapped and held at ransom. Not only does Mannix keep his composure throughout this, he is there for everything else in the business and other movies currently being filmed. One thing I can say is that I liked the story of Alden Ehrenreich's, he is zoned in as an actor to play in Westerns but when he is asked to do another genre entirely it gets quite comical. Sure there are other comical parts but his character's antics were by far my favorite. The rest of the sub plots were good but I wish they concentrated on other parts of the films. Like I said before I do not know a lot of their movies so don't take my word for it, I liked this movie but did not come out enjoying it fully. Sure it was great seeing familiar faces but I wouldn't see this again. See it if you like the Coen brothers past movies or wait for it on DVD.